A lot of you know that I love to make bread and I also love to eat it. One thing you probably don’t know is that I also love a good hamburger. No this post is not about hamburgers and yes is about the buns that go with the hamburger. I think that the hamburger bun is as important as the hamburger when it comes to a good sandwich. 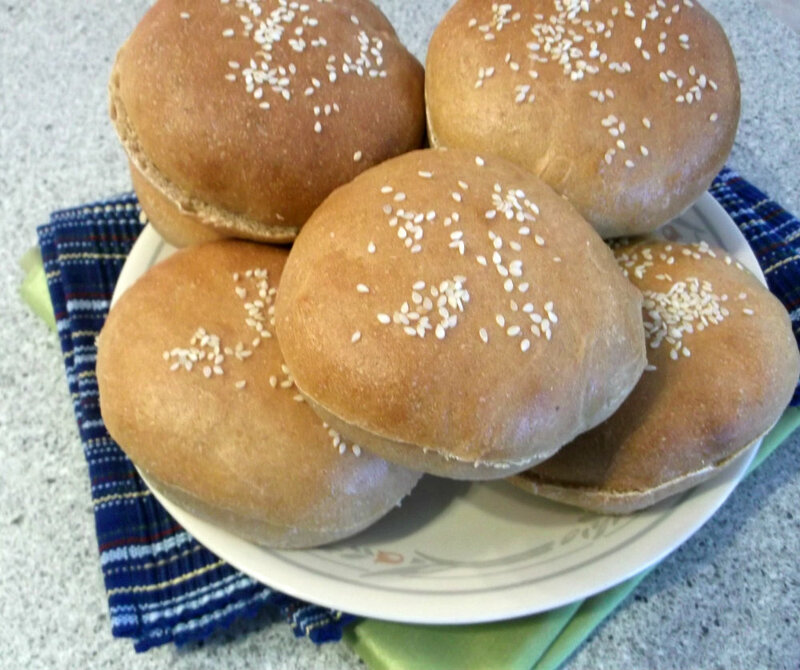 And it can’t get any better than nice fresh homemade buns. Don’t you agree? We had made hamburgers a couple of weeks ago and I was in the mood for fresh bread. So I decided to make the buns to go along with them. This is my first attempt at making hamburger buns and I guess that it is not really any different than making regular buns. But I wanted to change the white bun out with a whole wheat flour one. The buns were nice and light, perfect for the hamburgers that we were serving. There were a few buns left after the meal and we ate them with our meal the next night after warming them up in the microwave and a little spread of butter. They were yummy even without the hamburger. 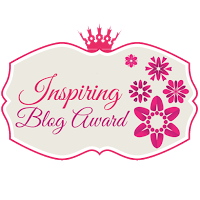 I also want to mention that Nina from Thoughts and Images Along the Way has given me an Inspiring Blog Award. Thank you Nina, that was so thoughtful of you to think of me. 2). Pass the award to two bloggers that inspire them. Here are the 7 random things about myself. 1. I am tired of winter and cannot wait for spring to come. The older I get the less I enjoy the winter weather. 2. I love to travel and hope someday that I can travel outside of the United States. 3. I love living out in the country. I love the peace and quietness of living here. 4. Although I love living in the country I do love visiting big cities. On of my favorite cities to visit is Chicago. 5. When I was a kid I loved to draw, but as I got older I had less and less time, someday I hope to get back into it. 6. I love to watch romantic movies. 7. I love to read books, although I don’t have much time to do that at this time in my life. 1. Life N Canvas – Ric’s blog is always upbeat and cheerful. And when I read his blog he always puts a smile on my face. 2. Grandma’s Kitchen Table – Kayte’s blog is filled with delicious recipes and lovely pictures. She is always upbeat and I love to see what she is cooking. Thank you again Nina for the award, I feel honored that you nominated me for this. I hope that you will visit Nina’s blog. She always has the most beautiful pictures posted on her blog and she offers some amazing recipes. Along with Nina’s blog I hope that you will visit Ric’s and Kayte’s blog also. 2. Once the ingredients are well blended, work in the rest of the flour. You will want to knead the dough until it is very elastic and just a little tacky, for a about 5 to 7 minutes. Grease the bottom of the bowl and turn bread to coat both sides. 3. Cover bowl with a towel or plastic wrap and set in a warm place for about 1 hour to 1 1/2 hours until the dough is double in size. 4. Lightly grease baking sheets. Take dough and form into balls 8 to 9 depending on the size you desire. Set on the baking sheets and press down with the palm of your hand. 5. Let them rise for about 30 to 45 minutes, so that they are about 1 1/2 inches high. 6. Preheat oven to 350 degrees. Take your egg white and water and mix until frothy, brush the tops of the buns with the egg white and water mixture. Sprinkle with sesame seeds if desired. 7. Place in oven and bake for 16 to 18 minutes or until golden brown. Cool to room temperature before splitting them in half. Thank you. I will have to try these! Congratulations on your award. So well deserved! Thank you for your sweet words, Dawn! I enjoyed reading your / facts … I’m tired of winter now as well! 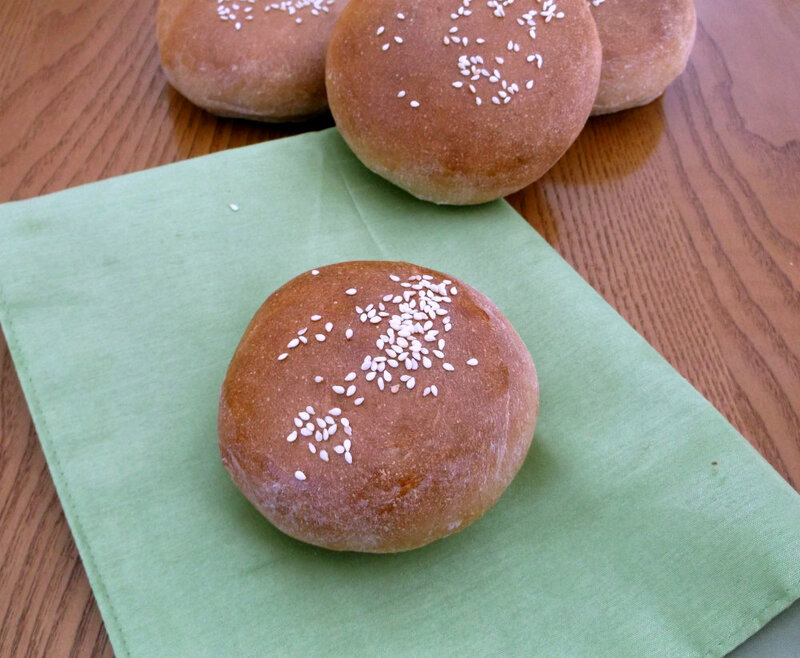 This nomination has your name written on it – I look forward of trying these whole meal hamburger buns … Lately we’ve been making hamburges from minced chicken meat, so I look forward of tasting them with your bread! I’ve never made hamburger (or hot dog) buns, and my wife and I were discussing this just a few days ago! Definitely something I want to try. I know it’s not hard, as your recipe certainly proves. Just need to do it! Thanks so much. 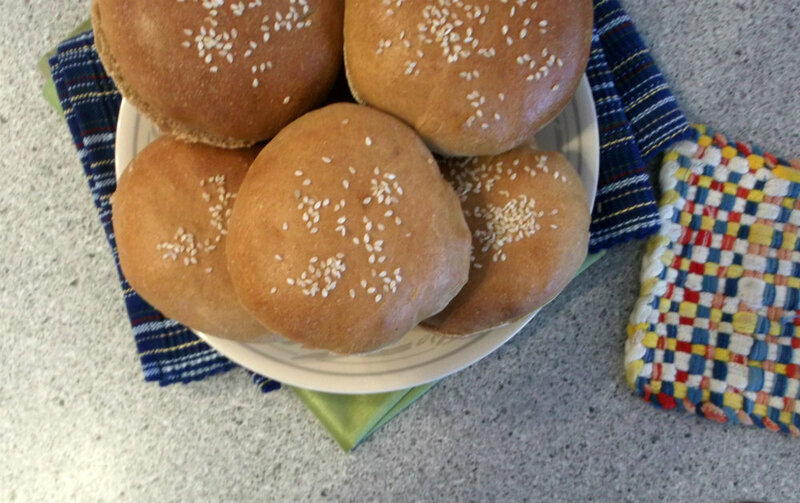 Nicely done on the hamburger buns – they look terrific! I am ready for spring/summer too & I also love romantic movies. I like a good hamburger as well and I know that everyone say that a good meat is a key, but bread is as important. I like that you shared a little bit with us. I live in Berlin (you should visit this city one day, it’s full of beautiful things and a history.) but I hope to move out on a country side for a while. And I love romantic movies!